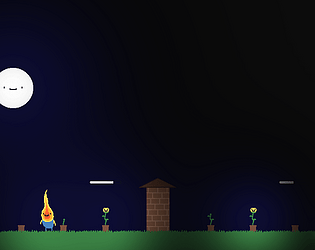 A game where you're a flame trying to grow flowers while sheltering from the rain and kicking away worms. Nice visuals and core gameplay! You should add sounds for the flame, worms, and actions (z and x). I like the graphics, and the ambient background sound works really well. Gameplay-wise, I would have lowed a bit more challenge and variation, but overall I enjoyed it. It's very very cute game! Kawaii! I love it! This game is top tier, one of my favorites.